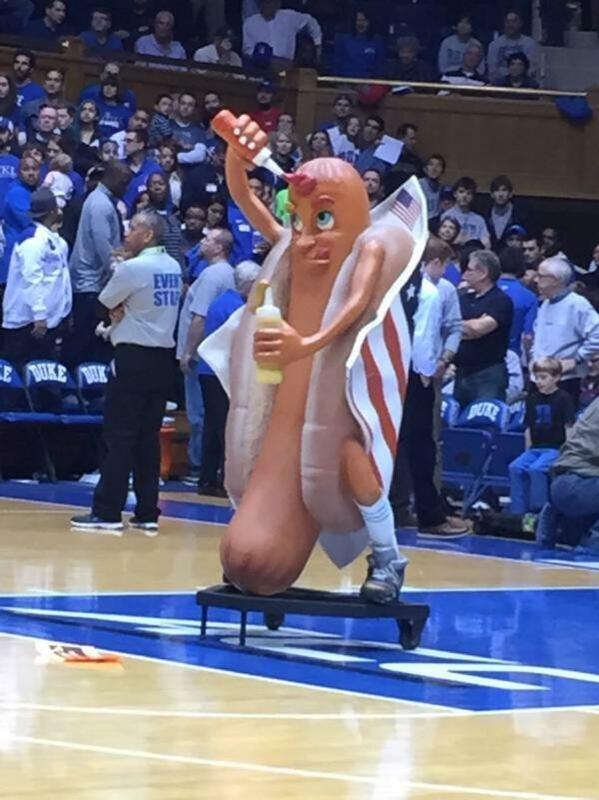 What Do We Make Of This Hot Dog At The Duke Game That's Trying To Eat Itself? First off, why is a hot dog rolling onto the court in a wheely cart at Cameron Indoor? Just doesn't seem like the most logical move. But obviously that's not what we're getting at here. This hot dog has some SEVERE problems. What's more American than wrapping an American flag around your body and cannibalizing yourself in front of thousands of teenagers returning from Thanksgiving break? Honestly, I can't think of anything. With that said, dude is determined. He even has that biting-my-lower-lip-because-I'm-working look going. He really wants to make sure he's delicious before he tries eating himself. All in all, none of this makes sense and, frankly, I'm a little disturbed. Regardless of what happens on the court today, little Timmy will always remember his first basketball game when a hot dog accessorized itself with condiments before eating its own body.